Where Do Deleted WhatsApp Messages Go? Have you ever asked yourself this question “Where do deleted WhatsApp messages go?” "Will WhatsApp or iPhone retain and store traces of chats even after conversation have been deleted by users?" it is known from many research that WhatsApp is not wiping deleted chats, and that ghost messages can be recovered despite encryption. Furthermore, some forensic scientists found out that WhatsApp accidentally stores traces of chats after being deleted, and this implies that expert hackers and data engineers could recover your deleted WhatsApp messages with advanced knowledge. Even with the latest version of this Facebook owned app, forensic traces of all deleted chats, deleted picture messages, deleted video files, deleted documents, or cleared and archived chats are still recoverable with the right tools. Therefore, WhatsApp creates a potential treasure trove of information for anyone with access to your iPhone. Since this is the case, what then is the reasonable means of maintaining data security and privacy protection while using WhatsApp services? "Where do deleted WhatsApp messages go?" 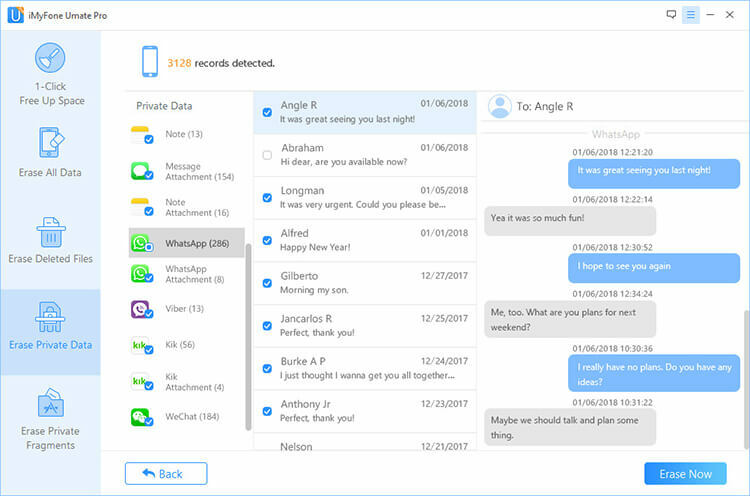 has become a common question as many people are becoming more aware of the need for data security and privacy protection, and we have been able to establish from different researches that the traces of such messages are still left on the device drive, which means deleted files are recoverable. Hence, deletion of Whatsapp messages is not enough. However, everyone enjoys using the communication services of WhatsApp in our daily social, leisure and work lives. Hence, deleting WhatsApp off our iPhones and mobile devices is not an option. For this reason, we shall be discussing a viable tool - iMyFone Umate Pro, by which we can permanently erase WhatsApp private messages and other private iPhone data without leaving any traces behind. Permanently erase selected WhatsApp messages, voice messages, photos, videos, etc. to be 100% unrecoverable. Scan previously deleted WhatsApp data which are still recoverable and completely wiped them. Fully destroy all the private traces left by third-party apps to protect your privacy. Also support to erase iPhone contacts, messages, call history, notes, browsing history, etc. How to Permanently Erase WhatsApp Messages? The need for stringent data security and privacy is not only for business that requires complex encryptions to ensure that communications remain secure and private; it should be extended to our social and personal life. You need to take control over your WhatsApp content, be it text messages, voice notes, pictures, exchanged files, or videos, and ensure that no unpermitted person get to access your private content. 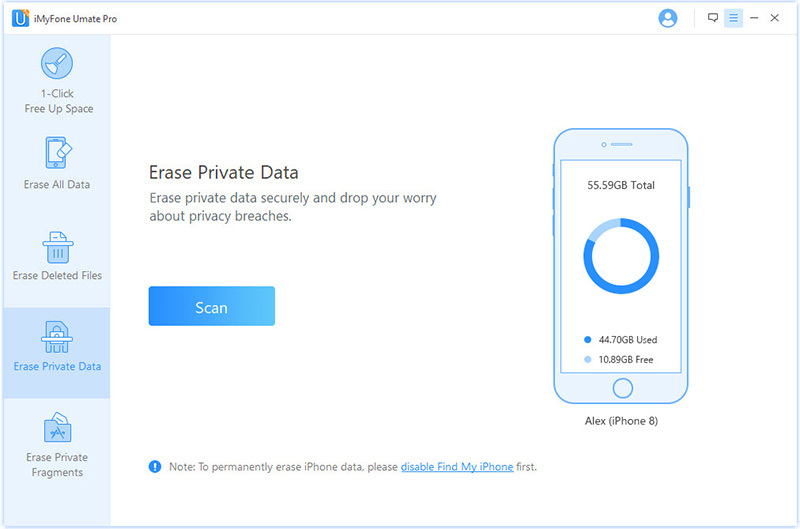 One effective way of keeping your privacy private is by utilizing iMyFone Umate Pro data destroyer in keeping your privacy on check. Step 1: Download and install iMyFone Umate pro on your PC, and connect your iDevice using a USB cable. Step 2: Choose "Erase Private Data" tab from the home interface, and click on "Scan" to Proceed. You can also choose "Erase Deleted Files" which will destroy previously deleted WhatsApp files. Step 3: After the scanning, iMyFone Umate will list all your private data including WhatsApp images, files, messages, etc. you can preview them before deleting. Step 4: Follow the self-explanatory on-screen prompts to complete the process. iMyFone Umate Pro is not totally free. But its free trial allows you to scan your private files. You can check how many deleted WhatsApp messages or traces are still left on your iPhone. To complete the whole erasing process, you need to register.